Properties in Samaná Province average 4.7 out of 5 stars. Property 6: Spectacular view! Luxury retreat! Luxury Oceanfront Condo - Walk to the Very Best of Las Terrenas - See Reviews! Property 8: Luxury Oceanfront Condo - Walk to the Very Best of Las Terrenas - See Reviews! Delightful Vacation Villa - Charming Family Vacation in the Tropics! 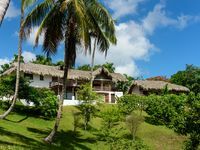 Property 15: Delightful Vacation Villa - Charming Family Vacation in the Tropics! Property 17: Nice Caribbean Style Villa , 1300m2 Property With A Private Swimming Pool. Property 24: Near the Ocean and Restaurants, accommodates 8, private pool, power inverter! Property 32: VILLA SOFIA - Luxury & design beachfront vacation home - Underwater bedroom ! Enjoy Happy Hour On The Private Roof Deck With Ocean And Mountain Sunset Views! Property 40: Enjoy Happy Hour On The Private Roof Deck With Ocean And Mountain Sunset Views! Property 44: Oceanfront, dog-friendly apartment w/ balcony & shared pool/gym/marina! 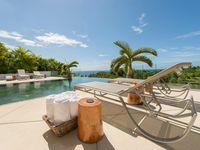 Property 46: Las Terrenas. Luxury New Property for 12 people maximum. Full service. Casa Phil was an amazing place to stay! The manager, Carlos, and the staff, Andrea and Victor, made everything very smooth from start to finish. We were just able to relax and have fun with nothing to worry about. The meals, prepared by Andrea, were scrumptious. The views from the Villa were beautiful, and the walk to the beach easy. A great place to stay for families or a group of friends. Highly recommend! We stayed at Casa Bamboulita in April, 2019, and had an amazing time! We were greeted immediately upon our arrival, and everything was as beautiful as the pictures indicate. The house was very clean, and the views were stunning. It was so nice to cook in the kitchen, with all the windows open overlooking the property. The house is a short drive to Playa El Limon - and I HIGHLY recommend visiting this almost deserted, unspoiled beach. It is also a short drive to Las Terrenas, with a beautiful beach there as well. It is about a 10-15 minute drive to a bigger grocery store called Super Mercado Lindo. We found everything we needed there. We will definitely come back to visit! Thank you Nicolas for letting us enjoy your beautiful home!